One of the most fun aspects of wedding planning has been choosing the décor. We've been making as much as we can (perks to having a very handy husband to be) and trying to be thoughtful whenever we choose to buy anything. The mindfulnesss that we try to practice in our every day life has extended all the way to wedding planning. We try to think about if it's something we'll use again in our future farmhouse's interior design or be able to resell or repurpose down the road. The rustic modern style we adore has been an easy choice for our wedding design. When you're wedding planning think outside of the box for your décor. We've found great pieces anywhere from craft stores like Joann & Michaels to Target, Amazon, Etsy and even the thrift store. 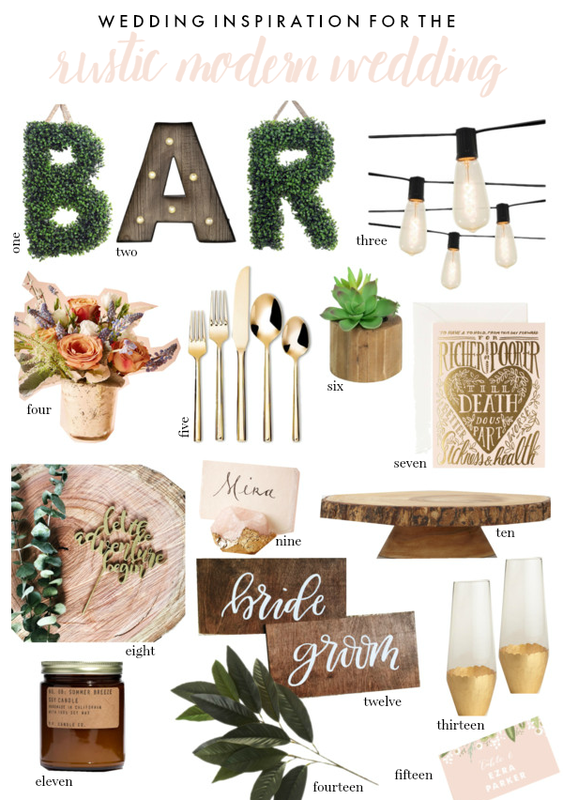 I've pulled together a few of my favorite rustic modern décor pieces that will be just as stylish in your home as your reception space! 1. Boxwood Monogram | 2. Rustic Marquee Letter | 3. Vintage Market Lights | 4. We're super into organic natural looks, rustic wood, and a little bit of boho for good measure. It's going to be a really fresh look inside of Kyle's renovated family barn- rustic but not country. I think our wedding will be a total reflection of our personal style, filled with cozy personal details. I seriously can't wait to show you how it all comes together in October! Get a look at all of our wedding inspiration on our Pinterest Board, La Petite Wedding! Ooh I love wedding-related posts! I'm a huge succulent fan, especially when they are used in wedding decor. Indeed, choosing decor is among the most creative aspects of the wedding. Couple of months ago, I arranged my cousin’s wedding at one of fabulous San Francisco wedding venues and decorated entire venue beautifully. Everyone liked it a lot.